Taste test: If you like to put gravy on your fries, you'll like these. They really do taste like gravy. 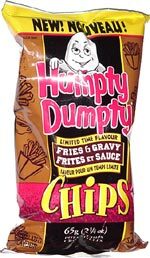 Lots of people have never heard of putting gravy on fries, and most of those people didn't like these chips very much. Smell test: Smells sort of like gravy. From the package: Got a taste for more? With Humpty Dumpty there's more for you. And now there's more flavours! We've cooked up an awesome, new, mouth-watering taste! These lip-smackin' chips are crispy, crunchy and pack a punch — but they're only in store for a limited time!